Merck & Co: Can the World’s Top R&D Lab Improve by Doing Less? The pharmaceutical firm Merck & Co. has a famous research and development (R&D) unit with successes that includes first-ever vaccines and cholesterol control drugs, all developed fully in-house from discovery to final development and approval. But the fame is fading these days, because their last successes were drugs approved in 2006, which means that they have had a long dry run and will soon be holding a portfolio of drugs with fewer and fewer patents. That means more competition and lower profits. Their solution is to do less research. They will sell many of the drug development projects they are doing, reduce the size of their R&D unit, and instead create a set of innovation hubs that are intended to look out for research done by others. These hubs are rumored to be planned for Boston, the San Francisco Bay area, London, and Shanghai. This probably seems like a strange idea. Can a firm improve its research record by doing less research? Is a hub that plans to look for research done by others really an innovation hub, and not an imitation hub? What exactly is going on here? The explanation is that Merck is finally starting to do what other pharmaceutical firms are doing. The pharmaceutical industry has increasingly lost its advantage in doing research relative to biotechnology firms and universities, and now it is common for pharmaceutical firms to look out for promising research done nearby, with an eye to create an alliance with the biotech firm or get a license for its product once it looks promising. Such arrangements are useful for two purposes. The first purpose is to do the research in an economical place. Biotech firms have two advantages over pharmaceutical firms in doing research. One is that they do it very well; the other is that they either succeed or go broke, which means that the cost of failures is borne by their founders and investors, not by any pharmaceutical firm. The second purpose is to grab research results from firms that usually cannot commercialize them. There are very few biotech firms that have the capabilities and resources needed to get a new drug approved for use, but pharmaceutical firms are experts in doing that. This means that the biotech firms can't get the full value out of their research, they need to sell it at a "discount." That discount, of course, becomes profits for the pharmaceutical firms. Researchers have followed this change to innovation and commercialization through a network of firms for a while, with the best-known articles involving Walter Powell and collaborators. The advantages of this system were pretty established in 1996, so Merck is a few years behind the curve in changing to it. The advantages of combining proximity to firms that do research with a central position in alliances is something that was documented in research by Whittington, Owen-Smith, and Powell, and it suggests that Merck not only needs to be in the right place, it also needs to have the right connections – the right alliances. Getting the right portfolio of alliances actually takes longer to do than building an innovation center, so there is no guarantee that Merck's new strategy will work soon enough for them. And if it took them many years to start following what researchers and other firms saw as the good way to locate research centers, it is hard to tell when they will start following advice on how to build alliances. I know where they could get it, though, having recently finished writing a book with Tim Rowley and Andrew Shipilov on how to get a Network Advantage through alliances. Greve, Henrich R., Timothy J. Rowley, and Andrew V.Shipilov. 2014. Network Advantage: How to Unlock Value from your Alliances and Partnerships. San Francisco: Jossey-Bass. Loftus, Peter and Rockoff, Jonathan D. 2013. Merck Plans Radical Overhaul of Drug R&D Unit. Wall Street Journal, Dec. 27 2013. Whittington, Kjersten Bunker, Jason Owen-Smith, and Walter W. Powell. 2009. "Networks, Propinquity, and Innovation in Knowledge-intensive Industries." Administrative Science Quarterly54(1):90-122. Juan Valdez Coffee: When Will People avoid Corporations? You are probably familiar with the corporation Starbucks, and you may also know that its stockholder value is nearly 60 billion US dollar, in part a result of having annual sales of more than 80,000 dollar per employee. Just so you don't misunderstand the last number, Starbucks uses the franchise system with many outlets outside the U.S. owned by contractors, so many of the staff members you see internationally are not Starbucks employees. For most coffee chains, expanding currently means challenging Starbucks somewhere, or at least some other coffee chain that has a similar product line, ownership, and strategy as Starbucks. It is far from easy given the long experience the largest chains have in making appealing product lines and effective operations. Now there is news that a brand that failed once, Juan Valdez, is going to try again with a new international chain of coffee shops. Juan Valdez sells Colombian coffee, and is aiming to expand to 250 stores by the end of this year. That will make it more than one hundredth the size of Starbucks, so we are talking about a really really small challenge. If Juan Valdez succeeds, Columbian farmers will benefit greatly. But will consumers be interested? An important key to the appeal is that coffee is one of the products that has started triggering social conscience in consumers, many of whom are aware that the prices keep increasing (bad weather is the reason this year) while poor farmers keep getting low prices. Buying coffee from the most impoverished places makes no difference; buying from corporations with fair trade practices helps a little; buying from a cooperative would help more. All this sound promising, and cooperatives have in the past been proven to be quickly growing, as I have documented in a paper with Hayagreeva Rao on the cooperative movement in Norway. But we also showed that the appeal was local: communities with past experience with consumer ownership liked cooperatives much more than communities lacking such experience. This is a challenge for Juan Valdez because many markets that they target lack such experience, so they have to target individual consumers rather than the practices of a community. It would be interesting to see if they can succeed. At least they have some ideas that stir the interest (and conscience?) 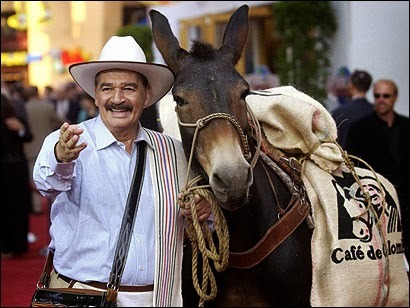 of consumers, like the live Juan Valdez character used in advertising (see below). It is a fun image, but the serious part of Juan Valdez is the cooperative of farmers trying to reach consumers directly. Greve, Henrich R., and Hayagreeva Rao. 2012. "Echoes of the Past:Organizational Foundings as Sources of an Institutional Legacy of Mutualism." American Journal of Sociology 118(3):635-75. Munos, Sara S. 2013. Juan Valdez Plans a New Challenge to Starbucks. Wall Street Journal, December 19 2013. Needed Innovations: How Much Misery Does it Take to Innovate? When we think about innovations, we usually consider high technologies that change quickly because of research, and we consider opportunities rather than threats. I wrote earlier about mobile phones with curved screens, which has now become possible as a result of improved technologies for screen displays. Nobody is sure how necessary they are, but if people like them they will be a big advantage for the two makers of such phones. But the high-tech, opportunity-driven innovation is just one part of innovations. Other innovations arise from needs and from shortages. Consider nickel. This material is needed in order to make stainless steel, and its extraction is a decidedly low-tech affair that just breaks a lot of rock and uses a lot of energy. But when nickel prices increased to more than 5 times the original as a result of China's use of steel, anyone making or using steel were facing shortages and price increases. Wall Street Journal has an interesting article on how this led to a complete rethinking of how to get nickel. Instead of buying nickel from abroad that was extracted from scarce and high-grade nickel ore, steel producers in China started experimenting with a low-grade ore that has a mix of nickel and iron. Such ore is inefficient for producing pure nickel, but prices became high enough that even this material started to be profitable. And more importantly, steel makers don’t actually need pure nickel. Nickel mixed with iron is perfectly fine for them because they will be mixing the nickel into iron anyway. From this insight they started a gradual process of improving an initially inefficient (and high-polluting) process until it has reached efficiency and cleanliness that is high enough to actually push the nickel prices nearly as low as their start. What made the effort successful in the end was the realization that a different kind of furnace was used than the kind had originally seemed best. This was an innovation born from a need and a shortage. The irony is that this new process could have been used much earlier, but no experimentation was made until the need grew serious. This is something I have written about before, and that has become an established part of our thinking about how firms behave. We do observe them thinking ahead, but there is also a lot of reactions to their experiences and their current needs. Along with Giovanni Gavetti, Dan Levinthal, and Willie Ocasio, I have written a chapter summarizing much of the current thinking about how firms make changes. The conclusion is pretty clear: It is well documented that firms respond to problems, which is the kind of innovation people don't think about so much. We know less about firms chasing opportunities, which is the kind of innovation people think about often. Wouldn't it be interesting to know whether this is because "responding to problems" happens more often, or because it is easier to discover? Batra, B. and J. W. Miller. 2013. Innovation and Investment Pop Commodity Price Bubble. Wall Street Journal, Dec 8 2013. Gavetti, G., H.R. Greve, D.A. Levinthal, W. Ocasio. 2012. The Behavioral Theory of the Firm: Assessment and Prospects. Academy of Management Annals 6 1-40. OK, admit it right away: you know what Lady Gaga's shoes look like. You may also have heard that the look is the work of Japanese designer Noritaka Tatehana, who totally puzzled his art college professor by turning in such shoes as a graduation project. But the designs delighted Lady Gaga, and immediately he became a star shoe designer. He is still not 30 years old, but he is beginning to have stardom enough to benefit others. He is starting a gallery called Pocket in Tokyo, which will be devoted to showing off young Japanese artists and helping their career. The tale of the shoe designer becoming an art promoter sounds a lot like something that could only happen in the world of design and art. After all, many people think of this as a world in which the criteria for judgments are unclear, assessments are very subjective, and status can be gained just by being near someone else with high status and having a flock of followers. But is this so different from business? It has been a while since research showed investment bankers and their customers to be hugely status conscious in their decisions (see Podolny's work). There is a lot of uncertainty in business, because so much of what is being done has to do with the future performance of a product, a research team, or an entire organization. Status matters in art and in business. Podolnly did not choose the investment bankers as a topic because they are less rational than others; it just happened to be easy to measure their status rankings. Later research has shown status to influence many business decisions, and to be especially important for young firms because of their uncertain futures and need to collaborate with others. It really matters who they work with, because the status sets the path for their future. In other words, Noritaka Tatehana understands well something that firm founders should pay very close attention to: the connections at the start are truly important. The role of status in alliances is something that I have written about in the new book with Tim Rowley and Andrew Shipilov (www.networkadvantage.org). We don't understand shoes that well, but would give Noritaka Tatehana top marks for his understanding of how business works. Demetriou, Danielle. 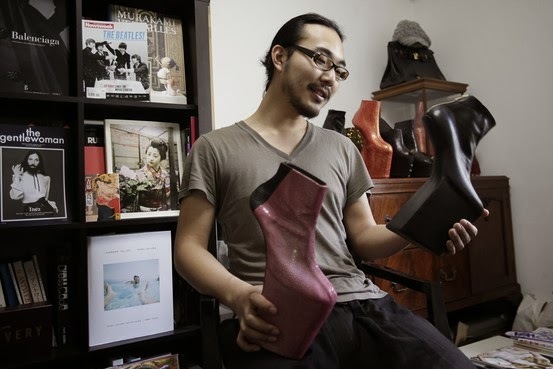 Lady Gaga Shoe Designer Opens Tokyo Art Space. Wall Street Journal, November 21, 2013. Greve, Henrich R., Timothy J. Rowley, and Andrew V. Shipilov. 2014. Network Advantage: How to Unlock Value from your Alliances and Partnerships. San Francisco: Jossey-Bass. Podolny, Joel M. 1994. "Market uncertainty and the social character of economic exchange." Administrative Science Quarterly 39(September):458-83. Recession Graduates: Do Today’s Young People Complain Less Than They Should? The global recession has had strong effects on the job market. A year ago, statistics from the US showed that more than half the unemployed had a college degree. This year, the unemployment rate of recent college graduates in the US was estimated to 17%. And the employed college graduates have pretty poor jobs; nearly one-half of them do work that does not require a college degree. Europe isn't any better, with high youth unemployment rates in many nations, including among college educated job applicants. So the conclusion is that a recession is a bad time to graduate, right? Yes, if you apply objective criteria. But people make surprising judgments, and job satisfaction is one of them. A study by Emily Bianchi will be published in Administrative Science Quarterly, and it has looked at the connection between economic conditions and job satisfaction. The result is clear and surprising: those who graduated and entered the workforce during a recession were more satisfied with their jobs, both soon after getting employed and later in life. How can that be? We know that recessions don't just create unemployment; they also reduce the quality of the jobs that are available. If worker judgments followed suit, they should be less satisfied. But still, those who got jobs during a recession are more satisfied because satisfaction is a result of how well you do compared with how well you think you could have done. This comparison is radically different in recessions, because each worker knows about the possibility of unemployment, and is pleased and grateful to have avoided it. This comparison with worse outcomes is unique for difficult economic times, because in boom times workers can instead compare with various success stories, and will have a harder time seeing unemployment as a possibility. And, the comparison is surprisingly stable. Graduating in tough times means continued comparisons with bad outcomes many years afterwards. So are recessions unimportant then, because people will be satisfied when they graduate from college and get jobs during a recession? Not quite. The study focused on those who actually got jobs: it is safe to assume that the unemployed are not satisfied with their situation. And the research also shows that there is a worst-of-everything state. A worker who got a job during good economic times will be less satisfied to begin with, and when a recession slows down the career outcomes that person will be even more dissatisfied. Bianchi,Emily C. Forthcoming. The Bright Side of Bad Times: The Affective Advantages of Entering the Workforce in a Recession. Administrative Science Quarterly.